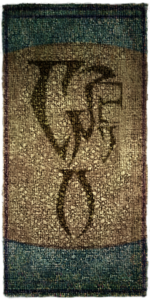 The Arena lies between the Redoran Canton and the Telvanni Canton. Comfortably domed with seats for hundreds of spectators, it is the site of public entertainment and combat sports. 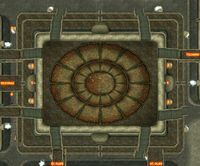 The Arena is an ancient place where honorable duels are fought, feuds are settled and matters of succession are decided. The Arena is the staging area for many quest-related duels. Unlike the Imperial City Arena in Oblivion, there are no apparent teams of combatants or scheduled matches. In addition to the fighting pit itself, the Arena is home to the secret headquarters of the Morag Tong. A variety of trainers are available in the Arena, including two master trainers: Senyndie for Acrobatics and Seanwen for Heavy Armor, both in the Fighters Training area. You may also obtain the rare Frenzy Creature spell from Minnibi Selkin-Adda in the Morag Tong headquarters. 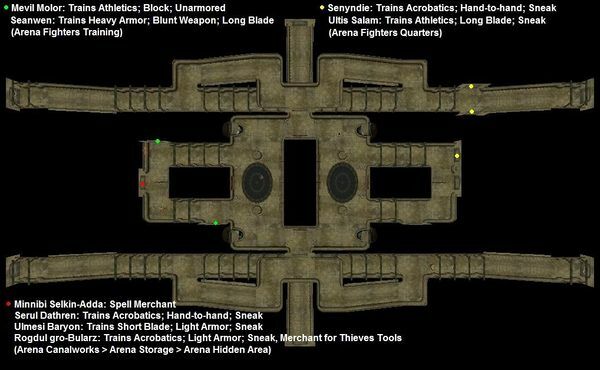 Arena Fighters Training area, Arena Holding Cells, Arena Fighters Quarters, and Arena Pit. The Arena Canalworks has two separate sections. You can only get between them via the Underworks or Waistworks. Storage room. Accessed from the Canalworks, western section. It contains a trapdoor leading to the Morag Tong headquarters, along with Taros Dral and Mephala's Quest. The Underworks itself contains a lone Dreamer. Arena Storage holds many crates with random loot, only guarded by some rats. It also has a bedroll should you need to rest. Arena connects to Redoran, Telvanni and St. Olms Canton through bridges. 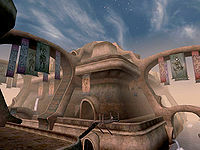 The Gondola at the northwest corner connects to Hlaalu, Foreign Quarter, Telvanni and Temple Canton. Mephala's Quest: Take care of this "free agent" for the Morag Tong. This page was last modified on 12 October 2018, at 22:19.